The Lost City of Z, an unabashedly old fashioned, bows-and-arrows school boy fantasy based on David Grann's non-fiction bestseller of the same name, stars Charles Hunnam as a British army officer turned explorer, Col. Percival Fawcett, who had a perilous obsession with the Amazon jungle. Despite years of being stationed overseas and proving his leadership abilities, according to his sneering superiors Fawcett "had a bad choice of his ancestry" -- his father was a drunkard and a gambler, and therefore forfeited his advancement in the army. With the help of the uppity Royal Geographical Society, together with Britain's interests in rubber industry in the Amazon, Fawcett is granted an expedition into Eastern Bolivia to map the fuzzy Bolivian and Brazilian border deep in the jungle. The two-year expedition means being away from his spirited wife Nina (Sienna Miller) and his young son, Jack. But man must do what he's got to do -- to restore his family name in good standing in a rigid society and be a hero and whatnot. Fawcett's small team, including Costin (Robert Pattinson) and Manley (Edward Ashley) with an Indian guide, goes up the river only to be attacked by various Indian tribes and suffer diseases and hardship. But the explorers not only find the source of the river, they also find evidence of an ancient civilization: broken potteries and sculptures of human figures. After returning home, Fawcett becomes an advocate against the general notion of the natives of America as arrow chucking, cannibalistic savages who are forever stuck in the early Iron Age. Finding the lost civilization in the Amazons becomes an obsession for him. With the backing of rich patron/fellow explorer James Murray (Angus Macfadyan), Fawcett and his team set out a second expedition, despite angry objections from Nina. When disease and the unforgiving climate of the jungle becomes too much for out-of-shape Murray, they have to abandon the mission. At home, the accusations fly and Fawcett strains his ties with the Royal Geographical Society. The first World War interferes with Fawcett's obsession as he is sent to the frontline, where he sees many of his friends die and himself getting injured in the horrific battle of Somme. Now nearing 50, and his son Jack a young man, father and son try once again to find the lost city. You can't escape the shadow of Werner Herzog when it comes to making a film set in the Amazon. Aguirre, The Wrath of God and Fitzcarraldo, about a man's obsession and his futile attempt to wield the course of nature both spiritually and physically, are towering examples to measure up to. All the hardships and suffering in the making of these films are justified by the breathtaking end results. It might not be fair to compare, since Gray is a very different kind of filmmaker, who prides himself in emotionally fine-tuned dramas. Despite all the glorious pretty picture show, well-rounded characters and fine acting don't really suit the adventure genre. But that's just it. His attempt at showing 'it's the journey not the destination' lacks a proper bravado and zeal, constantly interrupted by Fawcett struggling with domestic life and in finding his stature in the rigid society. Shot on 35mm by Darius Khondji (who also shot Gray's period piece The Immigrant), The Lost City of Z is a very handsome movie. Gray does his best to be faithful to the source material and instill every character with humanism. But I find Nina Fawcett's proto-feminist character too propped up to be believable in otherwise this male-oriented adventure film. 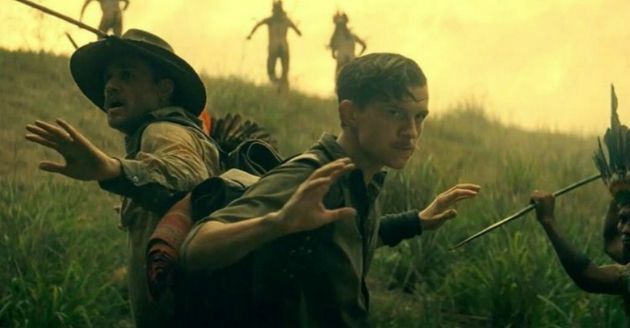 There is nothing particularly wrong with The Lost City of Z. I buy that one man's obsession -- 'a man's reach should exceed his grasp' -- is a worthy subject for a movie. Obviously, it's much less offensive than that last Indiana Jones film or Apocalypto when the depiction of natives are concerned. But do we need another film about a white man's journey to validate another culture's worth in this day and age? The Lost City of Z (and as well as The Immigrant), as a sumptuous and elegant epic it might be, doesn't quite justify all the effort put in by everyone involved. The film had its world premiere at the New York Film Festival. It is being distributed by Amazon Studios in theaters in early 2017.